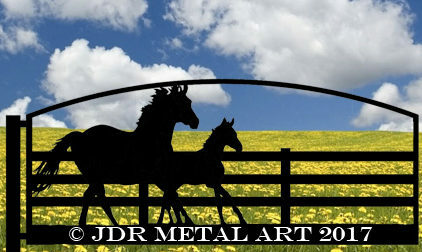 JDR Metal Art creates customized driveway gates for horse lovers all across America. 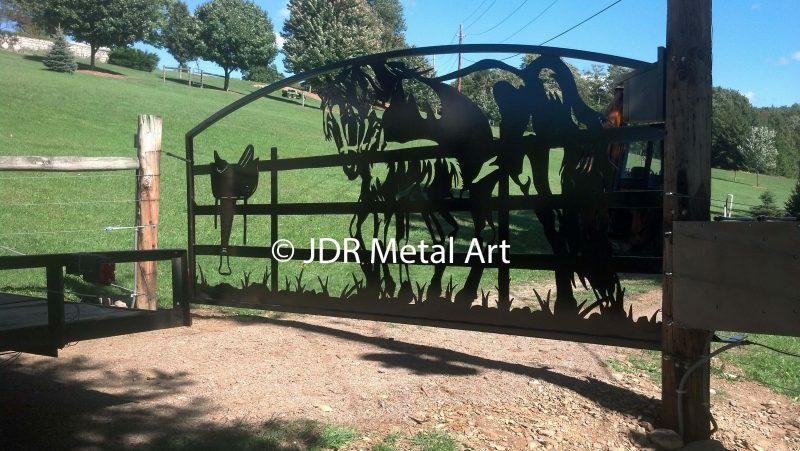 Whether you’re a “horseless” horse lover or you are with a large professional horse facility specializing in a specific breed or discipline…we have or will create the perfect horse themed entry gate for you. 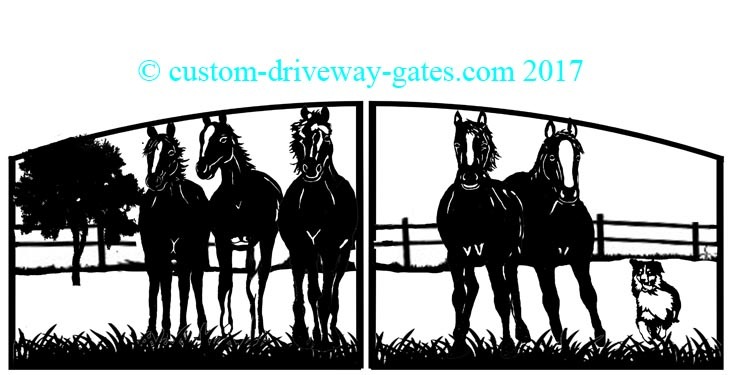 Shown below are pictures of different horse themed silhouette gates we have custom designed and built for past gate clients who were equine enthusiasts. Undoubtedly one of our most popular designs; we designed and plasma cut these Florida driveway entry gates to fit a 14′ opening. They are handcrafted with a rugged 2x2x1/8″ steel tubing frame and sheet metal silhouettes. Here they are shown after plasma cutting and polishing but before they were powder coated. Two sets of these were shipped out to the Diamond B Stables in Lake Worth, Florida. 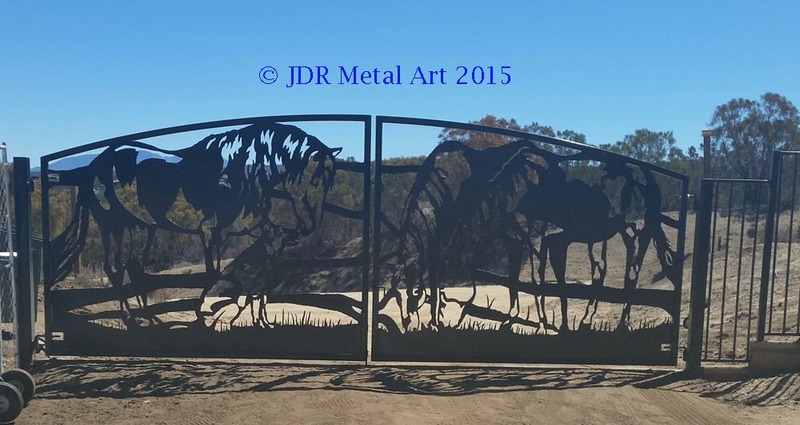 8′ tall and 20′ wide plasma cut gate with horse design theme. 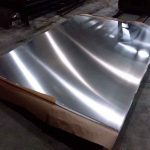 The design is cut from 3/16″ steel sheet. 6×6 steel posts. Black powder coat finish. Here is a dual swing gate we designed and fabricated for a California driveway entrance. Each panel is 7′ wide and 6′ tall. The gate design features three horses in a pasture. There is also a German Shepherd in the gate silhouette. Gates were painted black with acrylic urethane paint. Steel dual swing gates with a ranch design and 6×6 square tubing posts. Gate brackets for Apollo gate openers were prewelded to the gates and posts for easy customer DIY installation. This is a dual swing aluminum gate featuring equine design with copper powder coated finishshipped to customer in Los Angeles, California. 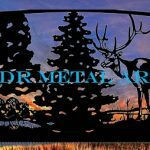 It’s a custom plasma cut design from 3/16″ thick aluminum sheet,welded into sharp corner square tubing with 3/16″ wall thickness. Installed by Perimeter Security in 2017. These dual swing steel entry gates feature a mountain theme and custom lettering for Colorado customers. Two grazing Quarter horses. The gate opener brackets were welded in place to the back side of each gate and posts for easy customer DIY installation. 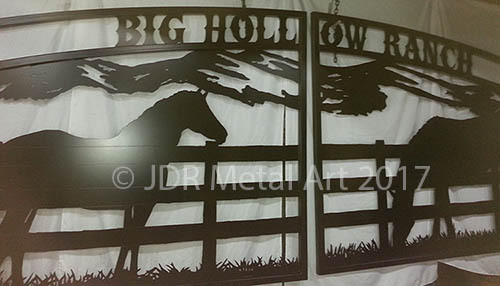 The plasma cut horse theme includes fence panel silhouettes and engraving. 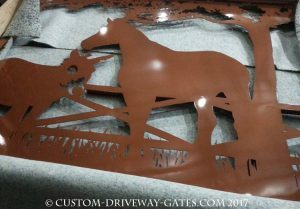 These Lexington, Kentucky driveway gates feature decorative race horses and an oversize horse shoe split in the metal. The gate pickets are 3/4″ square tubing. The gate frame itself was powder coated with a protective zinc primer and then black powder coat. The decorative elements were powder coated with a chrome top coat and clear coat. 12′ single swing steel gate hung from brick columns near Louisville, Kentucky. 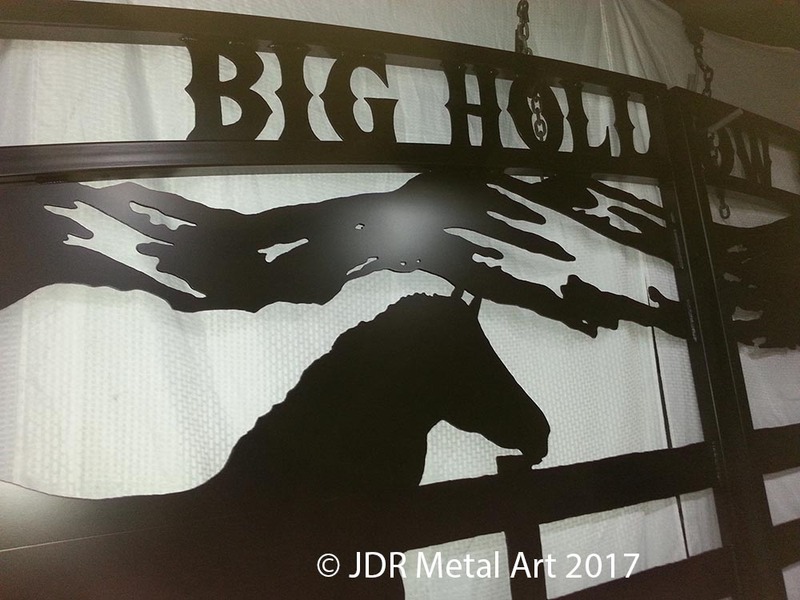 The artistic metal horse and dog silhouettes in this gate are plasma cut from 1/8″ steel built into a heavy duty 2″ square tubing frame. One of our popular choices. This particular one is a 14′ dual swing that was shipped to customer in South Carolina in 2017. 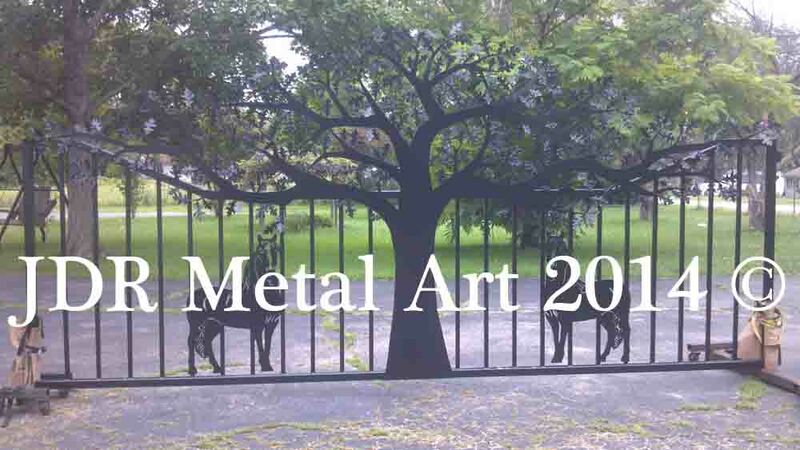 This decorative driveway gate is a 16′ residential single swing gate featuring metal art horse silhouettes welded to each side of the tree. It was custom designed and built in Ohio by JDR Metal Art and delivered to of our friends’ beautiful new Missouri residence. Here below is a picture of the same gate once it was hung from a steel post. The post was located behind large brick columns and supports the entire gate. The gate weighs about 400 lbs. These Oklahoma City driveway gates and overhead sign were custom made for a residence near Oklahoma City. The rusty gate design was custom made to order. With a total of 8 animals, it’s a busy scene. It features three paint horses and five dogs. 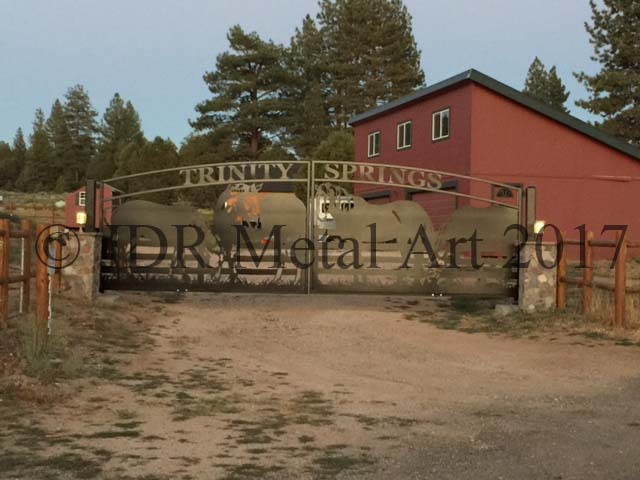 We plasma cut two of these 16′ single swing gates for our client; one went up at each entrance to the property. They are finished with a “rustic chic” muriatic acid wash that gives them an aged look overnight. Custom dual swing horse/tree design for entry to southern California property. Design is 8′ tall in the center. Here is an ornamental gated entrance project we delivered to a Sarasota, Florida residence. Four horses stand at a 3 board fence. The horse silhouettes were cut from extra heavy duty 3/16 aluminum sheet. The gate frame is square tubing with 3/16″ thick walls. The top is arched and 6’4″ tall in the center. Plasma cut aluminum gates better withstand the moisture-laden environment of central Florida than does steel. Aluminum is the same strength as steel but only about half the weight. Makes it easier on the openers. Each gate panel was finished with two coats of “super durable” 60% gloss black powder coat. 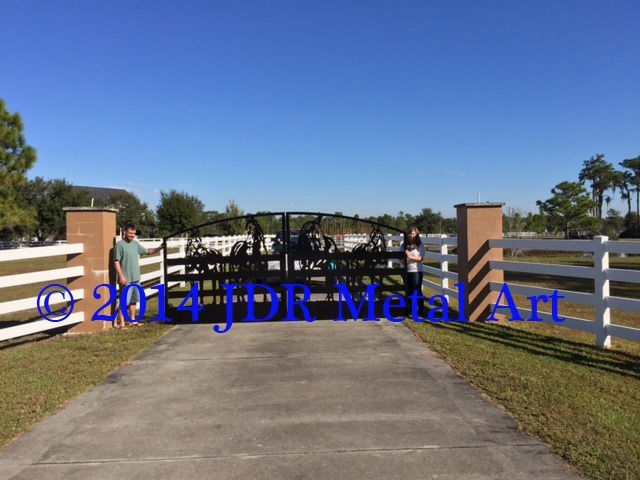 Gates were delivered by JDR Metal Art and installed by a local gate opener company. Design created to match mosiac in client’s home. The driveway gates look great..they were installed in Bradenton Area by Johnson Gate Openers. Photo by same. 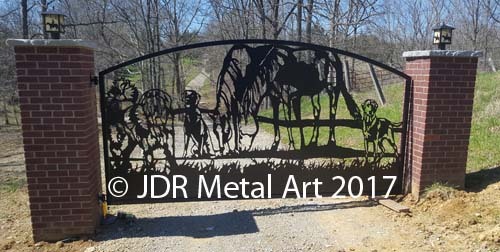 Here is a custom designed dual swing with a miniature donkey, Fresian and Gypsy Vanner horsesstanding at a metal art fence. 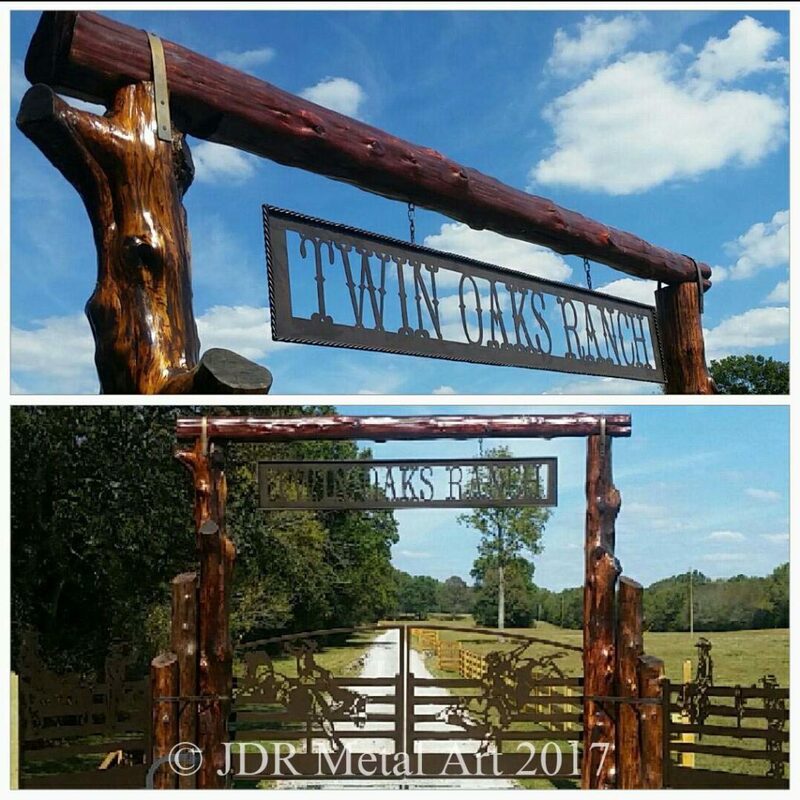 We really love how this gate turned out. The gates are 16′ wide overall. They were delivered from our shop in Columbus, Ohio to a home in North Carolina. They were mounted to stone columns by the client. We can combine any and all breeds you may have into one overall gate design. This was a fun project for the owners of a VRBO ranch in the Nashville, Tennessee area. We replaced two old entry gate panels with two new gate panels, installed the old openers to the new gates and also provided two side panels and an overhead sign which were installed by the owner. This single swing farm gate was close to 14′ wide. It’s 6′ tall in the center and arches down to 4’6″ on each end. The design is cut from super heavy duty 3/16″ A36 steel plate which makes the gate very strong. The frame is 2×2 tubing that has 3/16″ wall thickness . The design features a mare with her foal. There is also a saddle sitting on the fence. Customer installed Liftmaster LA500 gate opener. 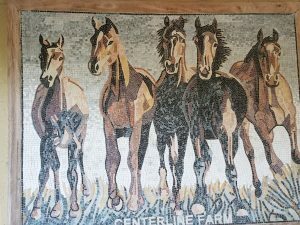 We are quite familiar with many of the breeds of horses out there and have done many gate projects with horse designs including Quarter Horses (Reining, English & Western Pleasure, Cutting & Trail Horses, Etc. ), Arabians, Standards and Thoroughbreds, Missouri Foxtrotters, Gypsy Vanners, Percherons, Tennessee Walkers, Paint Horses and others. 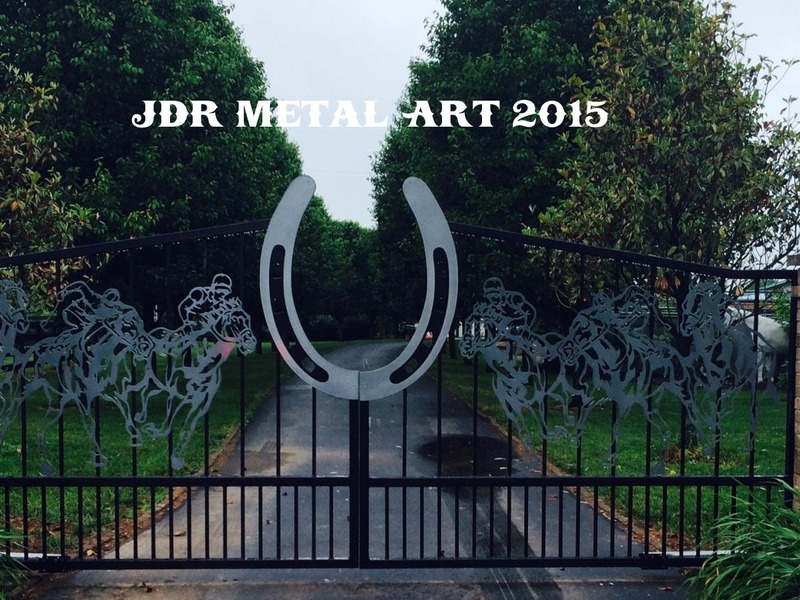 No matter the breed or design you have in mind, JDR Metal Art is ready to help you get your gate project going ASAP! 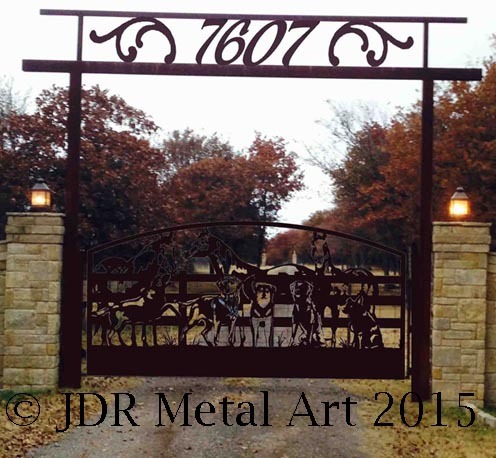 Are You Looking for a Custom Horse Gate Design? We work with horse folks from all over the country to help them create the perfect gates for their farm, ranch or equine facility. 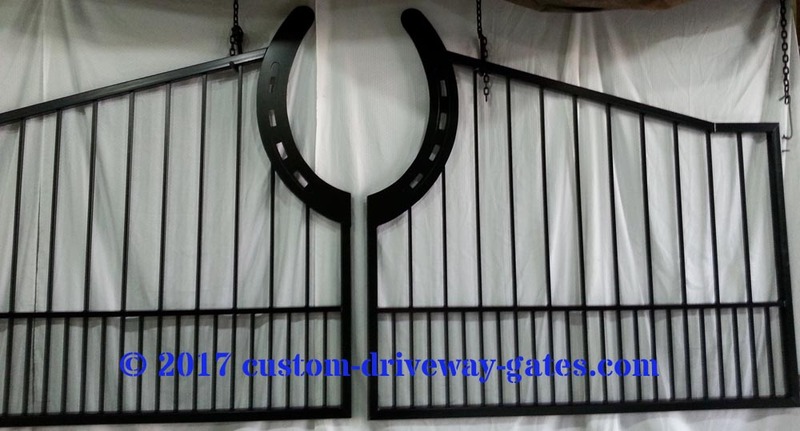 Our horse gate designs are perfect for all horse lovers because we customize them to represent any breed or discipline. We work with hunter jumper facilities, dressage farms, reining horse facilities, pleasure horse farms, cutting horse ranches, show grounds and fairgrounds, veterinarian facilities, boarding stables, and anywhere else horse lovers are to be found. 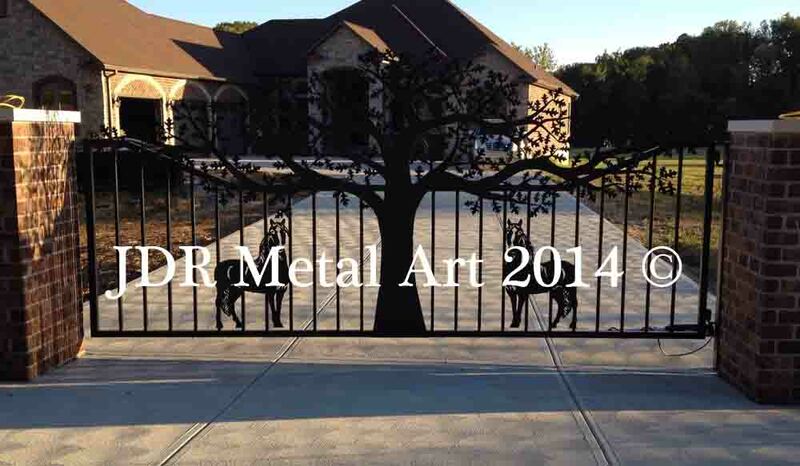 We also build driveway gates with wildlife designs, as well as tree gate designs. And we build picket style gates that are simple yet stylish, too! 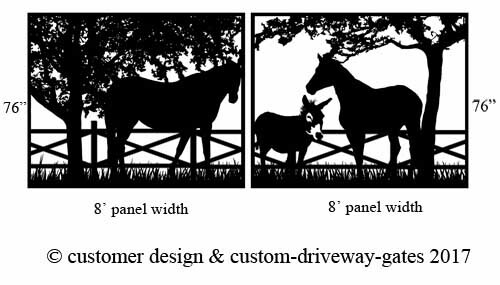 Our talented driveway gate designers are ready to create the perfect horse scene gate for your property. We pride ourselves on fast turnaround time and are committed to providing some of the most beautiful gates available. We work hard to give you a design that you will love to show off to all your neighbors! 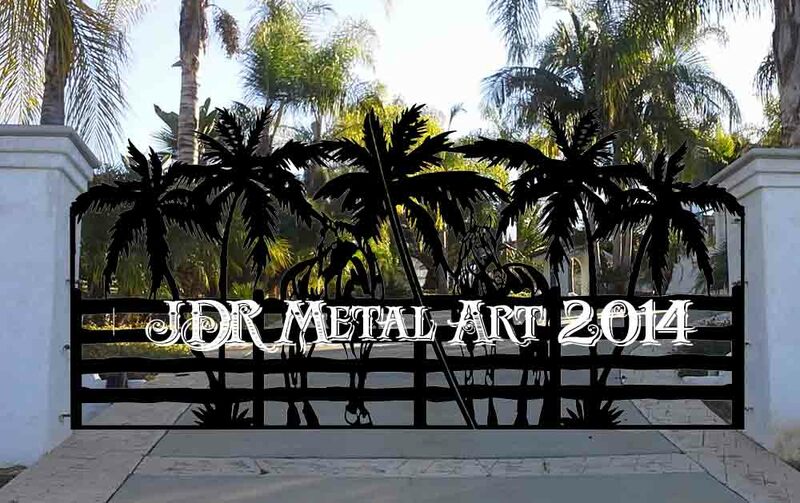 Depending on your needs and location, all metal art gate projects are either delivered by JDR Metal Art or packaged and shipped on a pallet for delivery to your home or facility, or to your local freight terminal for pick-up with a truck and trailer. We would love to help you get started creating your new driveway entry gates today! You can get in touch with us by using the form below with any questions you may have about pricing.